Did you buy beautiful oranges from the farmer’s market and cannot wait to take out your grandmother’s recipe and start making jars of sweet and sharp marmalade? Or perhaps you’ve decided to make homemade apple cider vinegar? But first, there’s a crucial step that you must do which many people miss – i.e., properly sanitizing and sterilizing the glass jars for storing homemade pickles, jams, relishes, chutneys and more. If they’re not properly sterilized, the bacteria inside the jar can cause mold growth, spoiling all your hard work and effort. 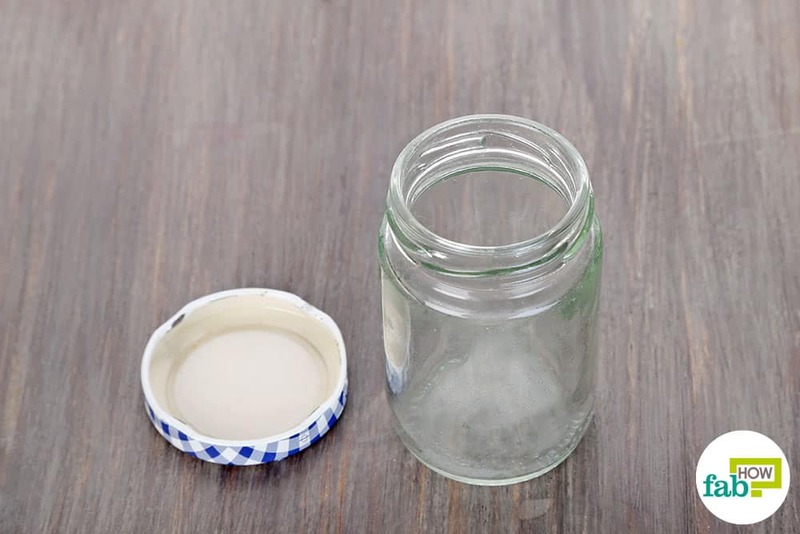 So, before you proceed with cooking or fermenting food, check out these six surefire ways and learn how to sterilize glass jars and bottles to prevent mold growth. One of the most traditional ways of sterilizing glass jars or even plastic bottles involves submerging them in a pot of boiling water. The hot, boiling water will eliminate any bacteria, which cannot survive at such high temperatures. It will also remove any remaining impurities, giving you optimum sterilization. Fill a large pan up to ¾ full with water and bring it to boil. Use a pair of tongs to put the glass jar and its lid into the boiling hot water. Leave them in the boiling water for at least 5 to 10 minutes to kill off all of the bacteria. Use the tongs to remove the jar and lid from the water, and place them on a clean, dry towel. Use the towel to wipe them clean. Let them air-dry completely before use. 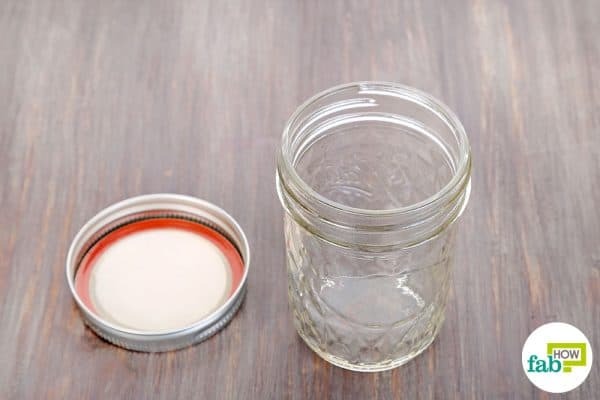 You can use this method to sterilize glass jars and bottles to prevent mold growth while storing jams, relishes and chutneys. 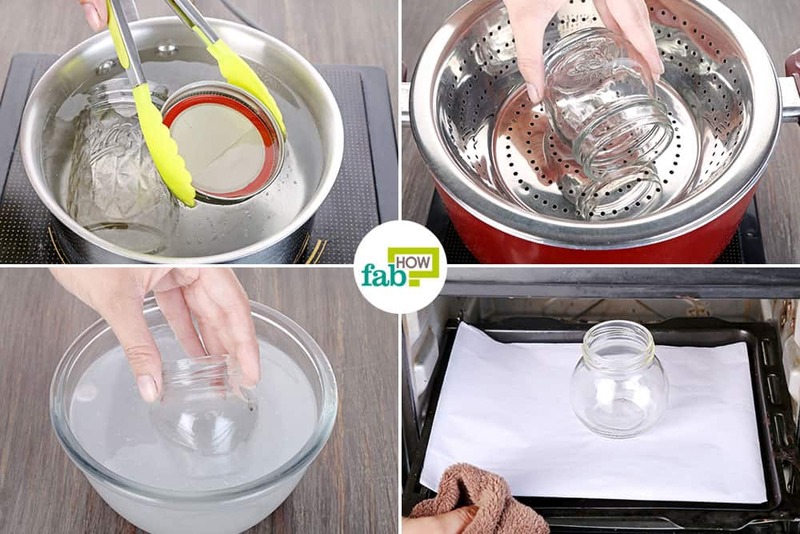 Another simple and effective way to sterilize glass jars is by using hot steam to kill-off all the bacteria from the surface of the jar and its lid, both inside and out. Use a large saucepan with a lid. Fill it halfway with water. Position a steamer basket inside the saucepan, so that its bottom is just above the water. It will function like a double boiler. Place the glass jar and lid in the steamer basket. Cover the pot with the lid and bring the water to a boil. Let the bottle steam for 5 to 7 minutes. Lift the lid and use a pair of tongs to remove the glass jar and its lid from the steamer basket. Place them on a clean towel, then wipe them clean. You can use these jars to store subtly flavored delicacies, as this method sterilizes your glass jars without using any chemicals. Another way of using heat to eliminate bacteria and other microorganisms from glass jars for proper sterilization involves heating them in an oven. You can preheat the oven to a high temperature, at which the mold-causing pathogens cannot survive. Preheat your oven to 210° F (140° C). 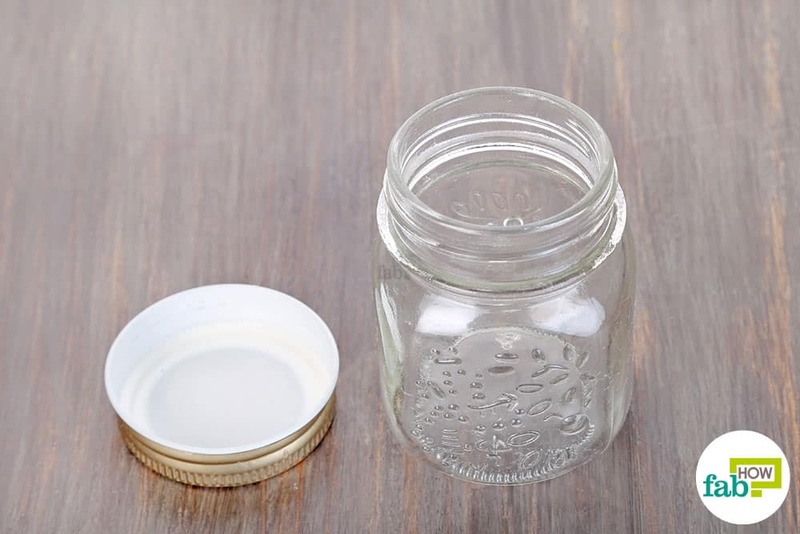 Wash the glass jar and lid with liquid dish soap to scrub off all dirt and impurities. 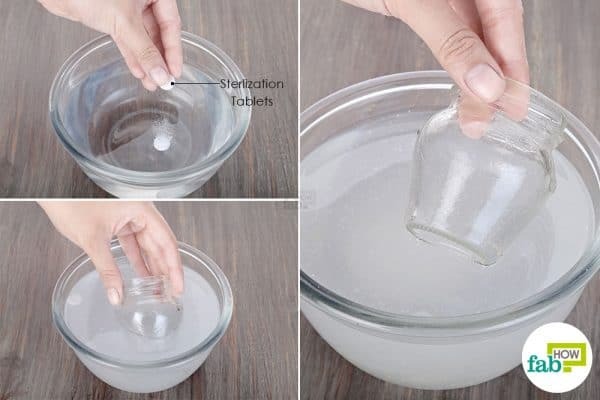 Rinse them with water to remove all residue and wet the jar a little. 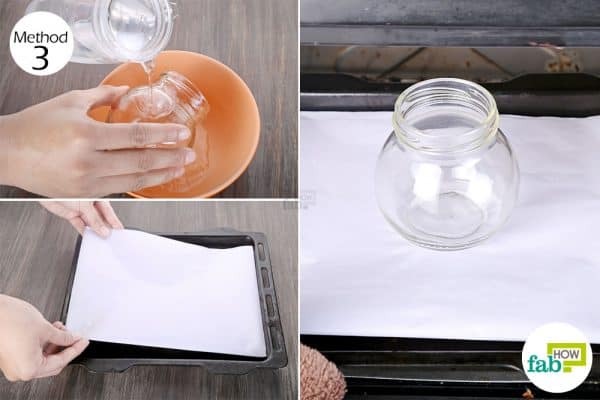 Put the baking sheet on a baking tray, and place the clean glass jar on it. Heat the jar in the preheated oven for 15 to 20 minutes for proper sterilization. 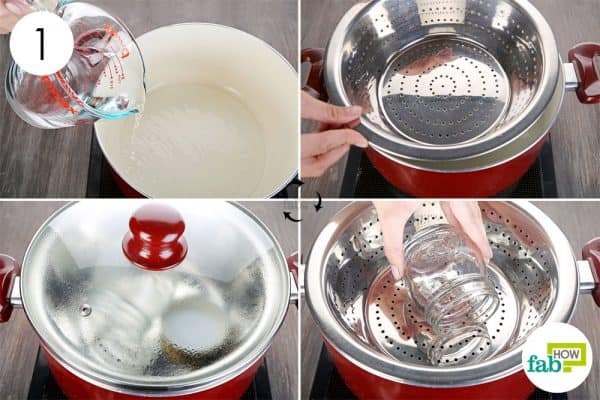 You can sterilize the lid in boiling water as described in Method 1. Afterward, remove it from the oven and let it cool down before use. You can use a microwave to quickly heat up and sterilize your glass jars and bottles to prevent mold growth. The microwave radiation is capable of completely inactivating bacteria, viruses and fungal spores. 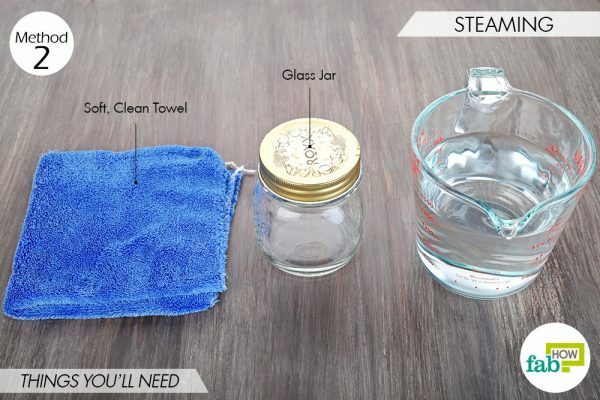 Wash the glass jar and its lid with liquid dish soap and water to remove all visible impurities. Microwave the jar on high heat for 35 to 40 seconds. While the jar is cooling down, you can sterilize its lid in a pan of boiling water as described in Method 1. Do not put a metal lid in the microwave. 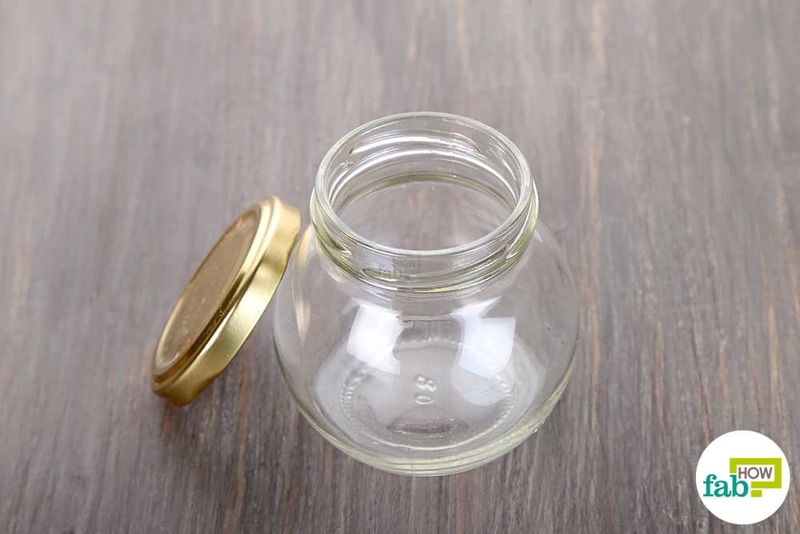 Your sterilized jar is ready for use, you can use it to make garlic-infused oil and vinegar among other things. 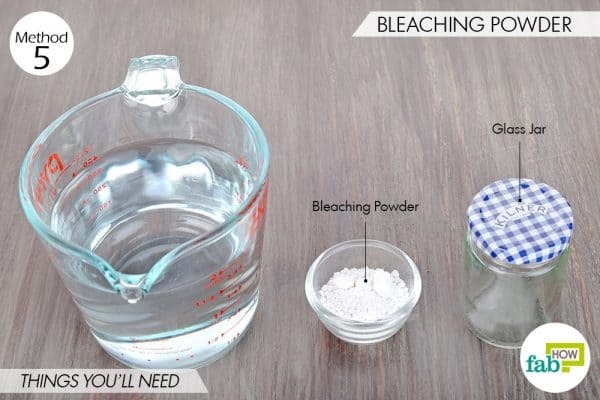 Additionally, you can make a sterilizing solution by mixing bleaching powder with water. Bleaching powder is a white powder made of calcium hypochlorite and is known for its bleaching as well as disinfectant properties. Fill a measuring jar with 2 cups of water and mix in ½ teaspoon of bleaching powder. 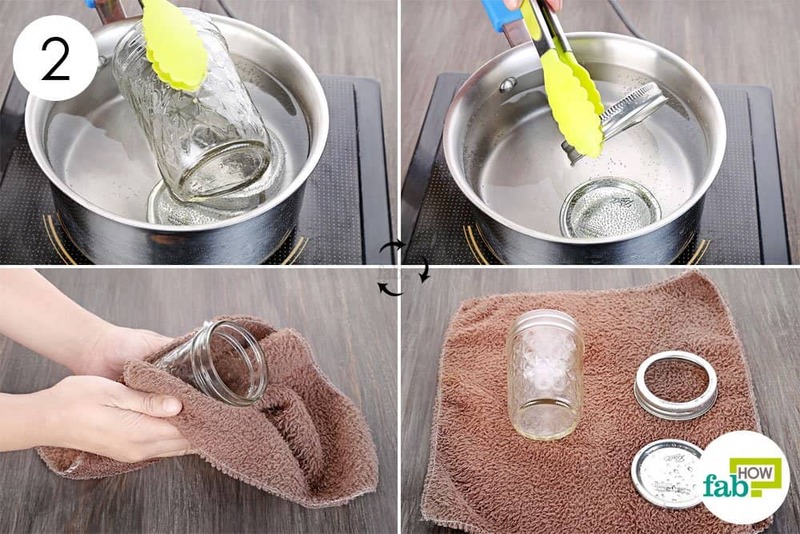 Use a pair of tongs to place the glass jar and lid in the prepared solution. Leave them in the solution for about 20 minutes. 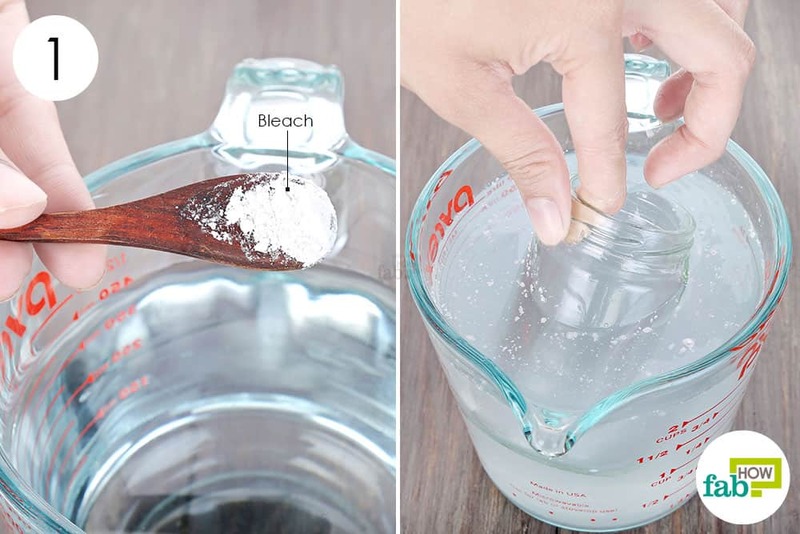 Remove the jar and lid from the solution using a pair of tongs. 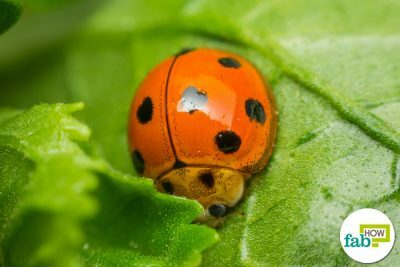 Rinse them with boiled water to wash off any remaining bleach residue, as it can cause gastric problems when ingested with the preserved food or react with the preserves themselves and alter their taste or color. 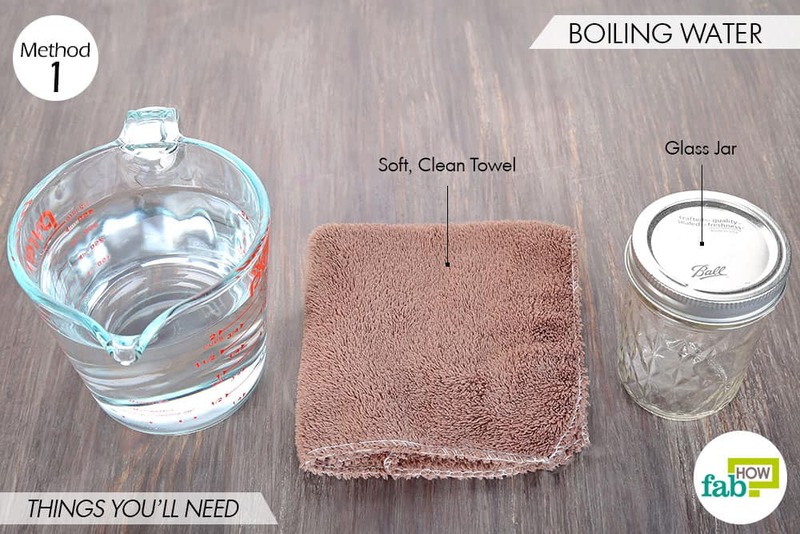 Wipe the jar and lid dry with a clean towel. Your sterilized glass jar and lid are ready to store preserves. 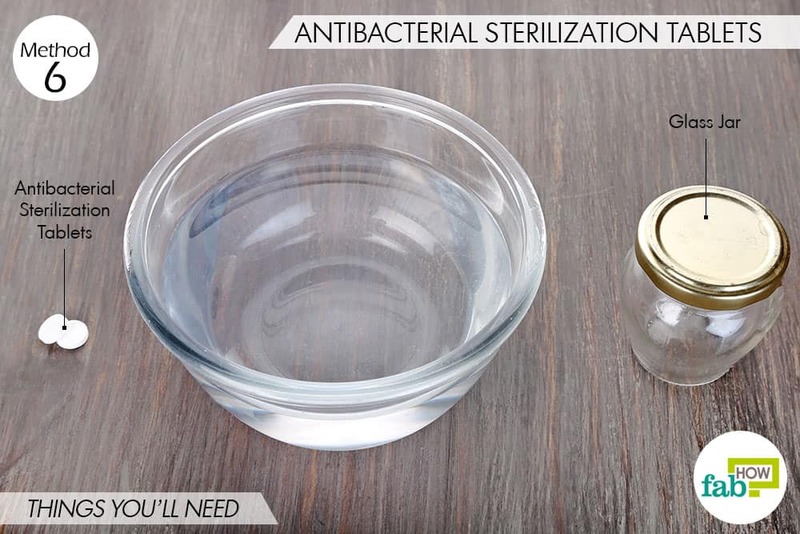 Antibacterial sterilization tablets are used extensively to sterilize your glass jars and bottles to prevent mold growth. These tablets are often made from hypochlorites and are highly effective at exterminating all forms of bacteria and other microbes, in this case mold-causing pathogens. While this method is highly effective, it may leave behind a slight chemical taste. Therefore, we recommend that you use do not use it for jams or flavored yogurt, instead use the sterilized jars for pickles and chutneys. Fill a large bowl with water, ideally one that can hold about 2 cups of water. Dissolve 2 antibacterial sterilizing tablets in it. Stir to mix it thoroughly in the water. Immerse the glass jar and its lid in the solution. Follow the manufacturer’s instructions to determine how long the glass jar and lid must be kept in the solution. Normally, it takes about 6 to 15 minutes. Remove the jar and lid from the sterilizing solution. Rinse them using boiled water. You glass jar and lid are now sterilized and fit for storing your handmade pickles and chutneys. While canning jam or any other hot stuff in a jar, let it cool down a bit before pouring it in. 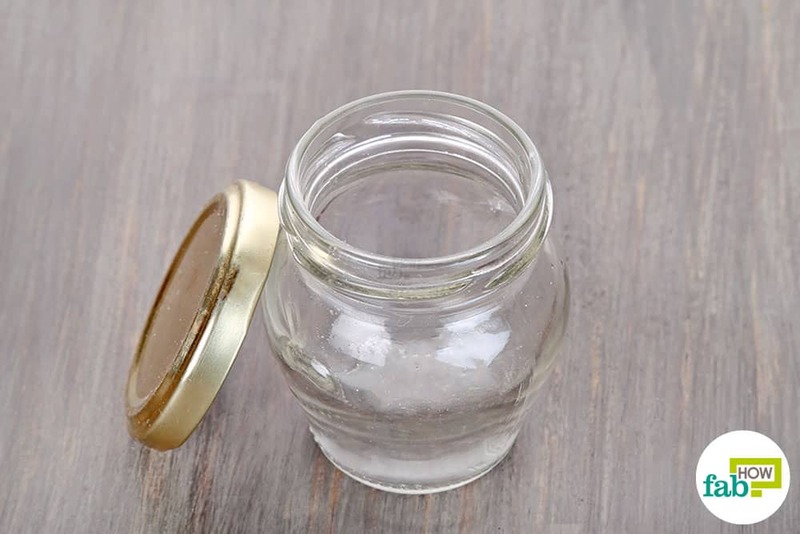 Always remember: Do not put hot stuff in cold jars or cold stuff in hot jars, as the strong temperature contrast can cause the glass to shatter. Check that the jars are completely dry before adding preserves and always store them in a dry place, as moisture is their biggest enemy. 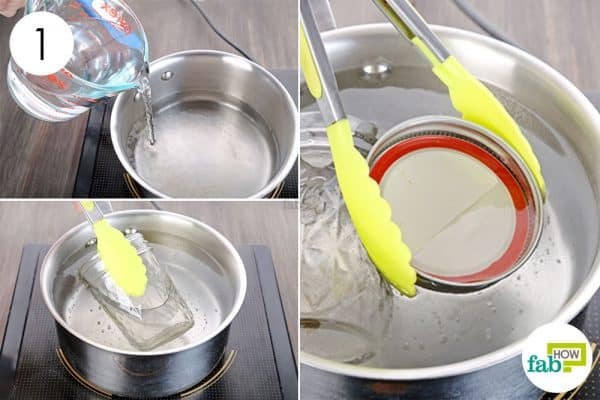 You can also use some of these methods to sterilize plastic bottles, just not the oven or microwave methods because the extreme heat can melt the plastic. 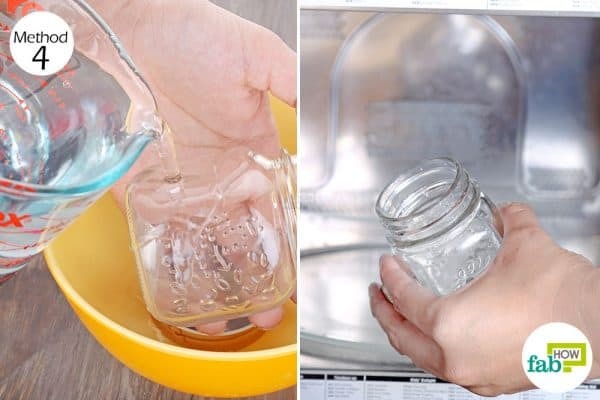 Alternatively, you can also sterilize your glass jars using your dishwasher if yours has a high temperature setting or if you have a steam dishwasher. Just place the cleaned jar in the dishwasher and set it to a rinse wash at the highest temperature setting. 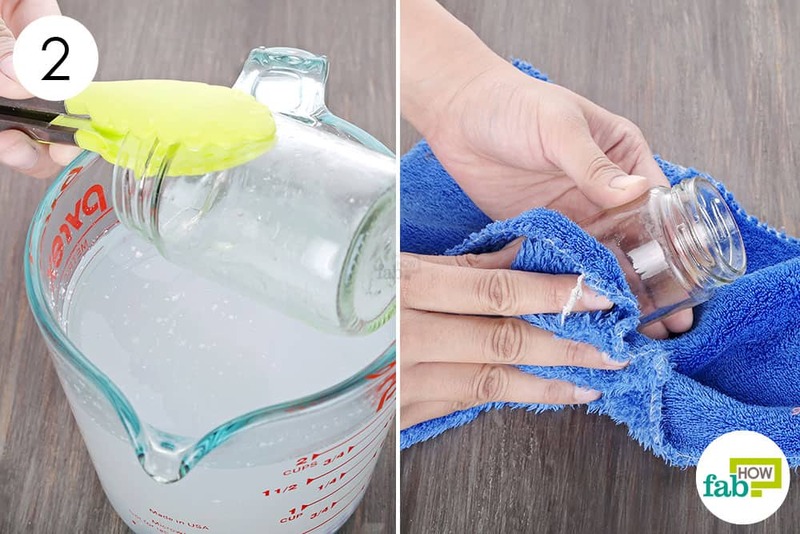 You can also sterilize a glass bottle using any one of the methods described above to store homemade DIY mouthwashes. Do the hot water and the hot air drying method are sufficient to sterilize the jars ? Thank you for mentioning the dishwasher method. 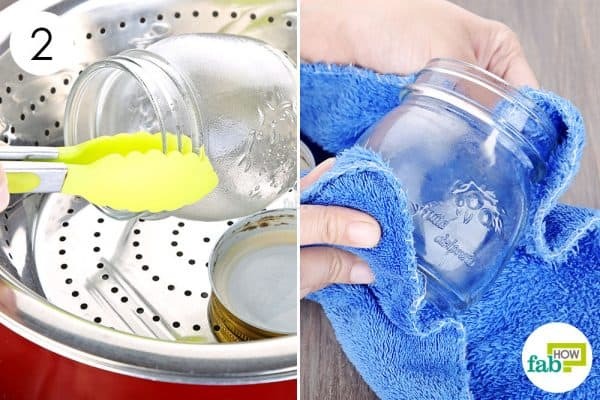 The dishwasher method is a good method for sterilizing your jars good if you have a high-temperature setting on your machine or a steam dishwasher. This method works well for screw top jars and the Kilner-style jars with a clip top and rubber rings. As for your other query,Yes. 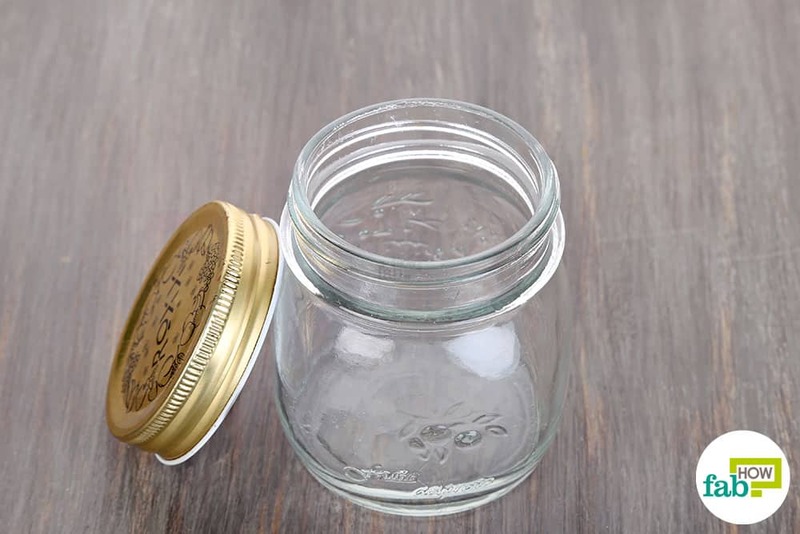 The hot water method and steaming method are sufficient enough to sterilize jars.